This lowland ‘drag’ starts at one of the most significant landmarks in Lincolnshire, ‘The Stump’ in Boston, a town with significant ‘pilgrims’ embedded in its history. It finishes at one of the great centres of mediaeval pilgrimage whose name is based on the Saxon saint whose remains were placed here – Bury St Edmunds (‘St Edmund’s Borough’). The route, from Boston to Bury St. Edmunds – is broadly southerly, crossing the Fens and staying as ever (self-catering), in a mix of village and church halls in Holbeach, Wisbech, Downham Market, Littleport and Mildenhall. Sections will be along the various major drainage channels such as the Bedford River, various ‘Ouse’ rivers and the River Lark. This is the least hilly pilgrimage we have ever attempted, the highest point being around 100 feet above sea level. The journey provides detailed experience of a fascinating landscape, an environment produced through creating extensive and complex drainage systems during the past 200 years. The effects of such drainage have produced interesting results with land drying and sinking below sea level and major environmental sites aimed at replicating the older fen landscape requiring water to be pumped ‘uphill’ to maintain their wetland quality. An appointed body manages many of the waterways: ‘The Middle Level Commissioners’, who oversee agencies with names such as ‘Nightlayers Internal Drainage Board’. The area has become one in which growing bowling greens and football pitches is a major industry. Other curiosities include the birthplace in 1835 of William Harley (of motorcycle fame) and a textile industry producing shirts for Burberry and gowns for Harry Potter! The ancient nature of much of the land was wetland with settlements perched on isolated patches of higher ground. Many of these settlements developed churches with towers that acted as markers in a seemingly empty landscape. The first attempts to drain the ground were simply in order to create grazing lands and that form of agriculture is remembered in the survival of the word ‘drove’ for many of the tracks leading across the drained ground. Walking country such as the Fens can be surprisingly difficult for those who are more used to rambles over mountains and hills. The unchanging horizon encountered on a lengthy, tiring day offers its own challenge that some find hard to manage. 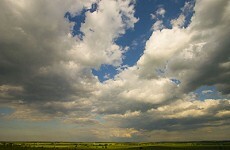 For others, the very same views, with their great sky-scapes, are positively exciting and inspiring. There is, in all this, much majesty and mystery. To see far, that is one thing, to go there that is another.